Friends and family often refer to me as a “character”. They employ this adjective with a fusion of humour, affection and bewilderment. Some may categorise my persona as weird or obsessive and, to be honest, I understand their viewpoint. I frequently provide a glimpse into the murky world of my psyche when I write and often reveal certain traits that some individuals would ordinarily choose to hide. One such characteristic is my “Obsessive Compulsive Disorder” (OCD). This condition manifests itself in various behaviours with a disproportionate attention to certain aspects of my life. I have an innate need to check doors are locked and windows are closed. Walking away from my car, I feel myself being psychologically pulled back to the door handle, to give it “just one last check”. I am obsessed with patterns and how things are the arranged. Placed in front of a coffee table, strewn with items, I feel an overwhelming need to tidy a pile of magazines into an orderly tower and arrange the coasters into a series of geometric patterns to ease my sense of dissonance. And then we have watches. I adore the design of vintage watches, but confess the only reason I don’t collect them is I don’t like to see signs of wear or ageing. A touch of patina, faded text, scratched case or irritating dust, just turns any horological yearnings I may have held into a state of flaccid disinterest. However, Omega revealed a watch, at Baselworld earlier this year, which delivers a 1940s aesthetic with a distinctly pristine appearance. Its handsome mien seems to perfectly fulfil my needs and, no doubt, those of “normal’ watch fans as well. The model is available in three noble metals, 18-carat white gold, 18-carat yellow gold and the interestingly named 18-carat OMEGA Sedna™ which exhibits a wonderful reddish hue. I particularly like the yellow gold variant, as it seems especially befitting to a 1940s styled watch. Indeed, it is this version which is the focus of this review. Omega has wonderfully captured the vintage mood with a silvery opaline dial, decorated with clous de Paris motif. It looks simply gorgeous, with its textured dial canvas creating pockets of darkness and shade. This is heightened by the glass box sapphire crystal and the curving edge of the dial near its outer edge. Three slender centrally positioned hands are all constructed of 18-carat yellow gold, conveying the hour, minutes and seconds. The hands are simple in shape, but feature a curving profile following the contour of the dial. Unlike the 1949 original model which featured Dauphine shaped hands, this modern-day Trésor has neater, lithe hands with truncated tips. Whilst purists may mourn the absence of the original style hands, I prefer the clean lines of the hands fitted to this latest model. Applied gold indexes tastefully denote the hours. Single batons are used to indicate each hour, save for 3, 6, 9 and 12 o’clock where double batons feature. The elongated profile of the indexes taper downwards, following the form of the dial canvas. The slender shape of the batons are exemplars of grace. Framing the dial are small discreet, black strokes which are useful when reading off the minutes or seconds. At 6 o’clock, a date window resides. Delivered in a crisp and highly legible form, against a pristine white date disc, the black Arabic numerals are simple to interpret. Case dimensions are something which often causes much debate within the watch industry and throughout the watch collecting fraternity. As a general, these days, when compared with watches of the 1940s, cases are much bigger. The mass stampede by many brands a few years ago to offer oversized watches, with cases measuring 46mm – 50mm diameter, has waned. For many wearers, the scale of these watches simply proved too large, especially for a diminutive wrist . However, personally, there remains several watches in this category that I like and, being a larger than average gentleman, their scale appears applicable to my own physique. However, sizes have definitely reduced of late and the 40mm case diameter of this Omega seems perfectly attuned to today’s tastes. The case has a restrained and cultured height of 10.6mm, allowing the watch to sit snugly on the wrist without unduly protruding. The short lugs follow a near horizontal path after leaving the case band, only slightly tapering at the very end. This can be problematic on larger case sizes, but with the Trésor it proves to be perfect. The watch sits relatively flat on the wrist, reaffirming the sense of slimness and conferring a very comfortable fit. All surfaces of the case are highly polished, yet it never feels outré or craves excessive attention. The Trésor, however, to my eyes eloquently conveys discerning, good taste. Gracing the reverse of the watch is an exhibition case back which reveals the hand-wound movement within. 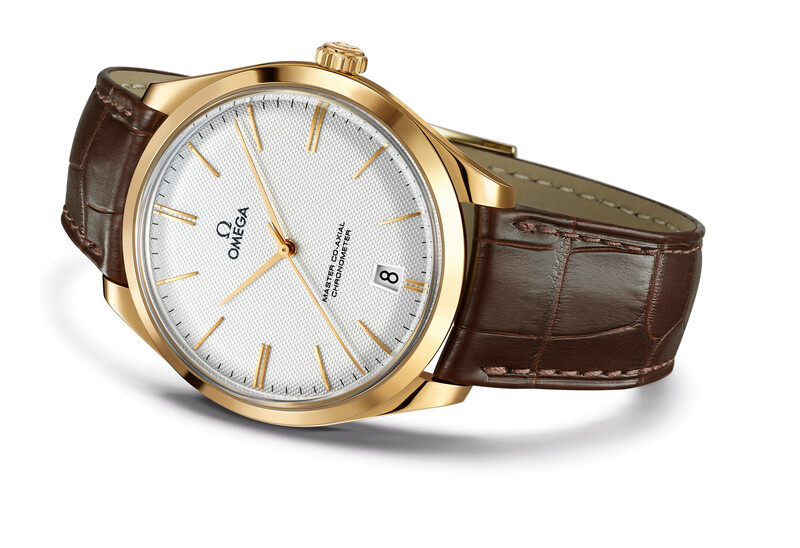 The hand-wound Calibre Omega 8511 features a myriad of meritorious aspects to its specification. It is a chronometer, denoting a high degree of precision. A Co-Axial escapement, developed jointly by Omega and legendary watchmaker, George Daniels, produces less friction than a conventional Swiss lever escapement, delivering greater precision. 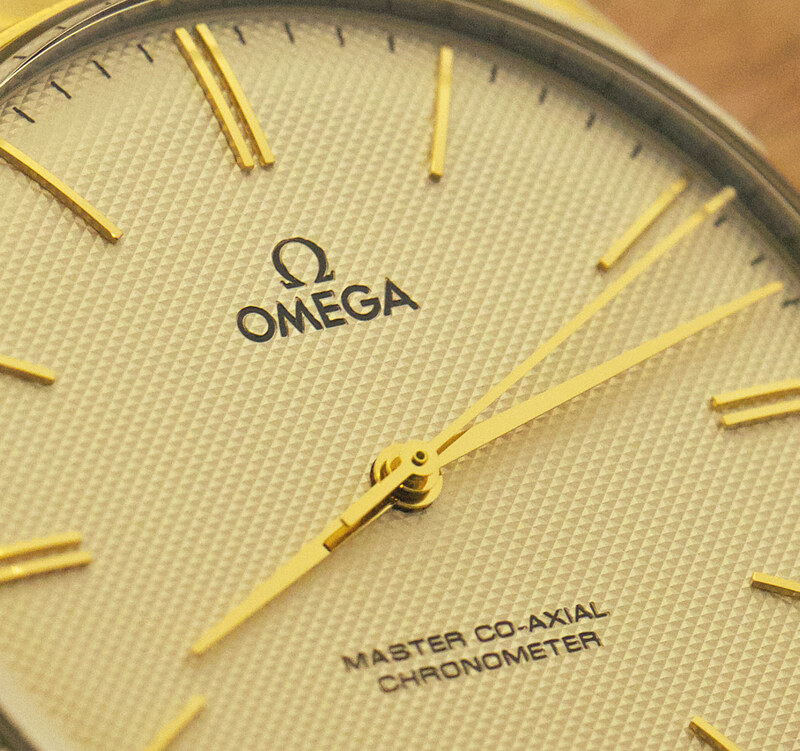 The Omega 8511 contains a free sprung-balance, featuring a silicon balance spring. This provides greater accuracy when in different positions, than a balance equipped with an index-adjuster. Twin barrels, mounted in series, collaborate to deliver a power reserve of 60 hours. The movement has a resistance to magnetic fields of 15,000 gauss. This is all the more surprising as the watch features an exhibition case back. Other brand’s have denied the wearer the sight of the movement by fitting a soft-iron case back to help improve magnetic resistance. I applaud Omega in achieving superb magnetic resistance without denying my eyes the opportunity to see the movement within. 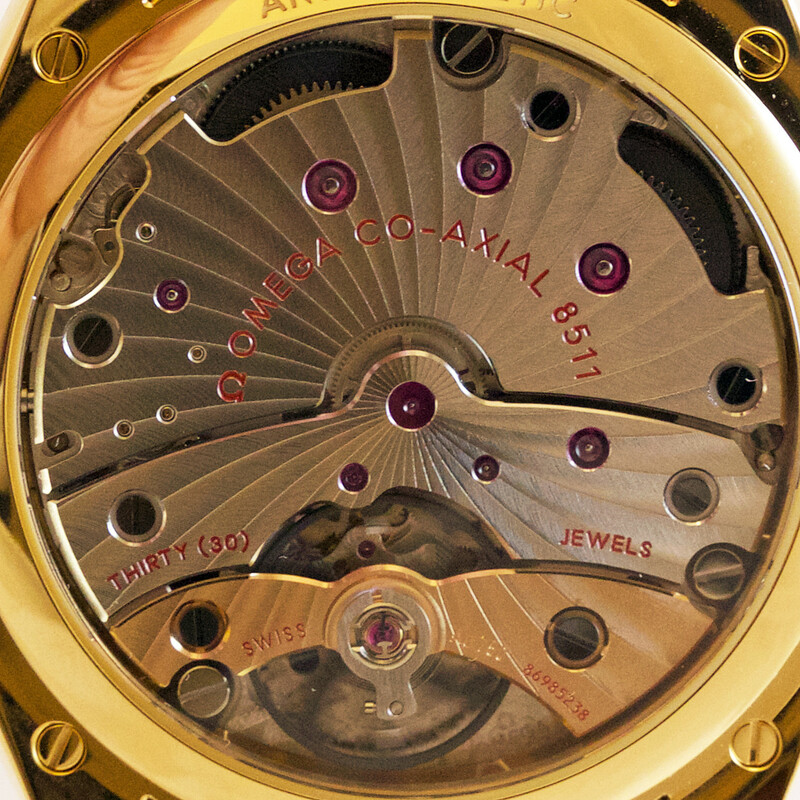 The Omega 8511 is a supremely attractive movement. The bridges are adorned with Côtes de Genève, delivered in a very fetching “arabesque” design. The bevelled edges of the bridges, shine resplendently, providing a charming contrast with the adjacent surfaces. However, my single most favourite aspect of the movement design is the gold balance bridge, it is absolutely stunning. The Omega De Ville Trésor of 2014, takes inspiration from the original 1949 model and distills it into a beautiful creation for today’s consumer. Omega hasn’t merely reintroduced a former model, but carefully blended some delightful aesthetic codes of a vintage watch and enhanced it with some modern-day know-how. 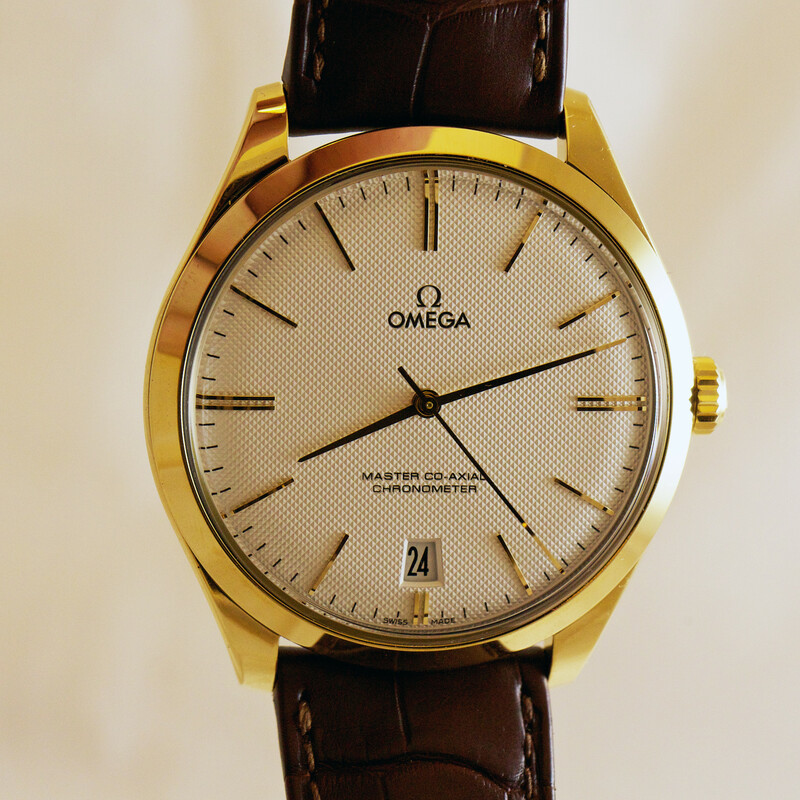 The outcome is one of my favourite Omega watches for a long time. If other brands, could adopt a similar approach to their new models, I, for one, would be delighted. There are some incredible designs in the back catalogues of many brands and the prospect of delving into a treasure chest of historical gems without any signs of wear, offers much appeal to this OCD sufferer. • Case: 18-carat yellow gold; diameter 40.00 mm; height 10.60 mm; water resistant to 3 bar (30 metres); sapphire crystal to front and case back. • Movement: Calibre Omega 8511, hand-wound movement; 30 jewels; Power reserve 60 hours. • Strap: Brown leather strap supplied on an 18-carat yellow gold pin buckle.